Insomnia is running rampant in today’s world, with around 1 in 3 people struggling to sleep well at night. Lack of sleep can be simply due to poor sleeping habits, or it may be something more challenging such as restless leg syndrome (RLS), anxiety, ADHD, stress, chronic pain, or autism. The benefits of using a weighted blanket for insomnia have been recently revealed for these and other sleeping problems. In this review we’ll take a deeper look at the Quility Weighted Blanket to see if it might be right for you. Eco-Friendly Non-Glue Polyester Padding. The blanket stays soft with its polyester padding. Many companies use toxic glue in their paddings to keep their blankets together, but this poly padding is held together only by stitching making it non-toxic and better for the environment. Sewing technology keeps the blanket in place—long-lasting and durable. An extra layer of padding keeps the glass beads from leaking. 100% Satisfaction Guaranteed. The product satisfaction guarantee means that this purchase is virtually risk free. The company offers a full refund on the product, without asking any questions. Possible Leaks. As with many weighted blankets, it seems the greatest risk of purchase is the potential for the glass beads to escape from the stitching and fall out into the bed. Temperature. Some people find that weighted blankets are often too warm for their use and this one is no exception. This may be because of the polyester filling inside the blanket, making it susceptible to trapping body heat. 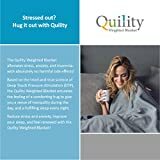 The Quility Company derives its name from “tranquility”. They state that they are dedicated to the care of its customers so they offer a no-questions-asked money-back guarantee. The company also makes sensory swings for therapeutic purposes. Making a wise purchasing decision means hearing what others have to say about their experiences with a product. 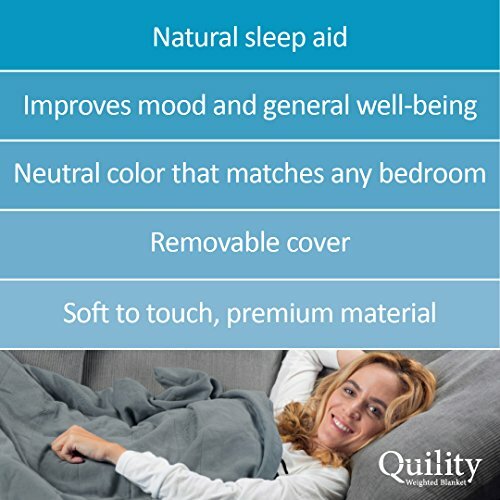 Here we’ve gathered the most important information about the Quility Premium Weighted Blanket to help you determine if it’s right for you. Gaining high reviews from more than 800 customers, this product has received well over 4 stars as an Amazon rating. 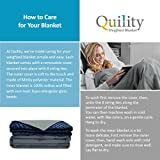 All in all, this Quility Premium Weighted Blanket offers a wide range of sizes and weights for various people. The company seems to be up and coming, offering a good return policy. The prices are a bit higher than some, but the fact that a duvet cover is included in the price makes it affordable at the current market value. 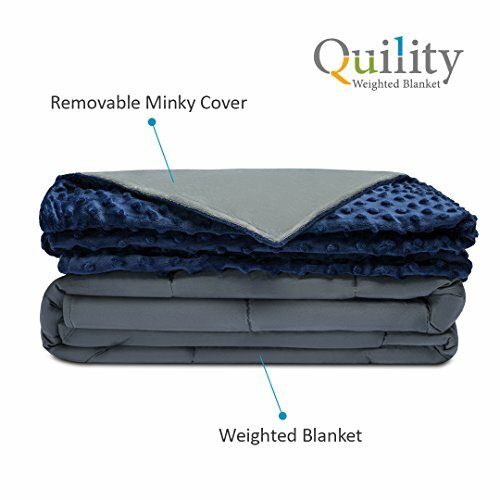 All in all, the Quility weighted blanket may just be worth trying out!